The Gear Bag Chest is kind of a cross between a rucksac and a souped-up bra. I don’t have (particularly large) breasts, so of course I say that from a position of slight ignorance, but I don’t think it’s a bad comparison. I find the name, Gear Bag Chest, a little confusing. It’s one of those phrases you can mull over repeatedly in your mind, a slightly different meaning emerging each time. Does ‘chest’ refer to the part of your body? Perhaps it’s a nod to a pirate’s treasure chest..? The later somehow seems more pleasing to me. The GBC has two main pockets, which when worn lie directly over your chest and the top of your back. The front pocket is obviously meant to be the business end of matters, providing space for essential fly boxes and leaders. I carry two C&F type boxes in the main front compartment. They are the smaller ones, about 6″ or so tall by 4″ wide, and they fit snuggly together behind a small sheet of elasticated mesh. This is a clever touch, which means that the boxes stay put when the main zip is opened. The front compartment. At left my two main fly boxes are shown (they actually fit snuggly side by side when fitted properly, unlike in this picture). At right is the included fly patch, which sticks onto a velcro surface on the inside front of the pocket. Behind the mesh that supports the fly boxes there are another couple of sheets of mesh perfectly retain my leader wallet, seamless rings and fishing permits. The first time I started digging around back there it felt like a bit of a Pandora’s box, with magical gear space appearing from nowhere. I have tried carrying sausages and mash in there, but apparently Pandora is a vegetarian. In front of the front pocket (which makes it the frontal front pocket, way out front, a true affront to waistcoats and society) is a wee pocket design to store leader spools. Apparently the leader dispensing system is patented. Hmm… interesting. I actually find this to be one of the most annoying features of the pack. While the pocket boasts 5 separate little holes for pulling your leader material through, the pocket itself is about big enough for 2 spools of Stroft. I have tried using the leader dispensing holes, and even with just two spools of nylon I find the spools get stuck easily. Another view of the front pocket(s). At left the endless elasticated mesh pockets inside the main pocket. At right the ‘patented’ leader spool holder/dispenser, complete with two spools of Stroft. Either side of the main compartment at the front are the side pockets. I store odd bits and bobs in these. They are kind of a funny shape, but a bit of jiggery pokery and it’s possible to fit quite a bit in them. 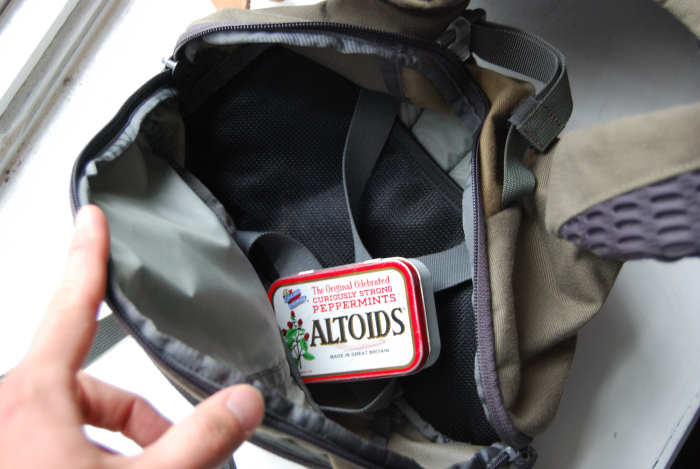 The side pockets, located either side of the front compartment, are quite spacious, and really useful for slightly less-used items like line grease and fly drying powder. One of the best things about the GBC is that it is really comfortable to wear. The bra straps that go over your shoulders are very well padded, and help the pack to ride very nicely over your sleek, contoured body. 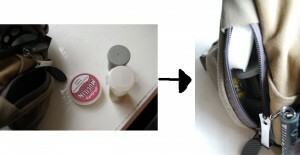 There are also side clips underneath your armpits that help the bag to ride close and so preventing it swinging about. 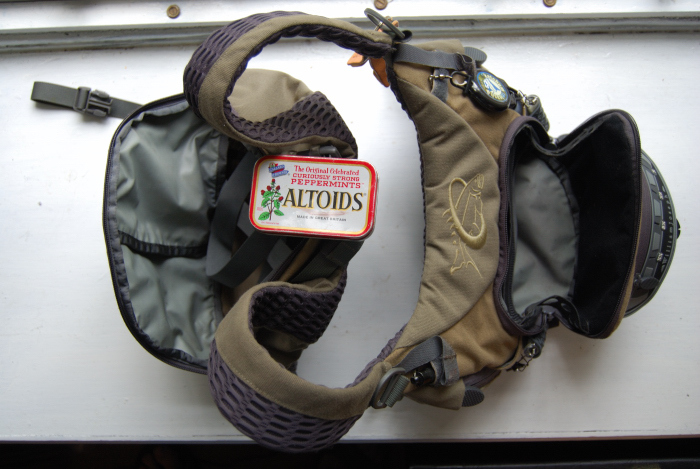 I always use these, they are really essential for a comfortable gear carrying experience. The straps are great: thick and soft (a bit like your author). 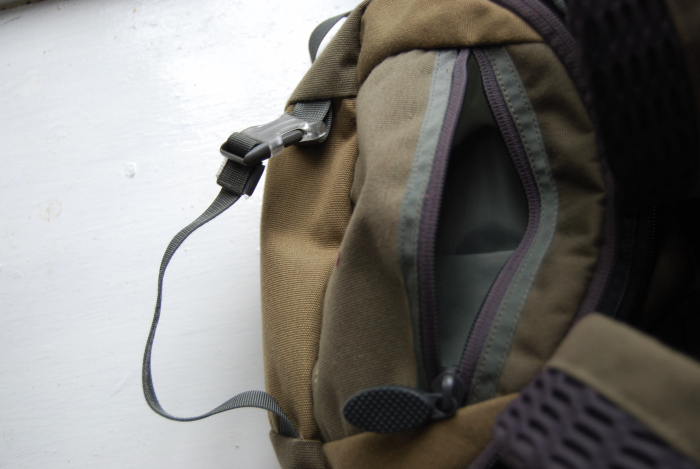 They also have little D-rings on the front side, useful for attaching….stuff. Also on the front of the bag are a couple of good quality stretchy zinger things. 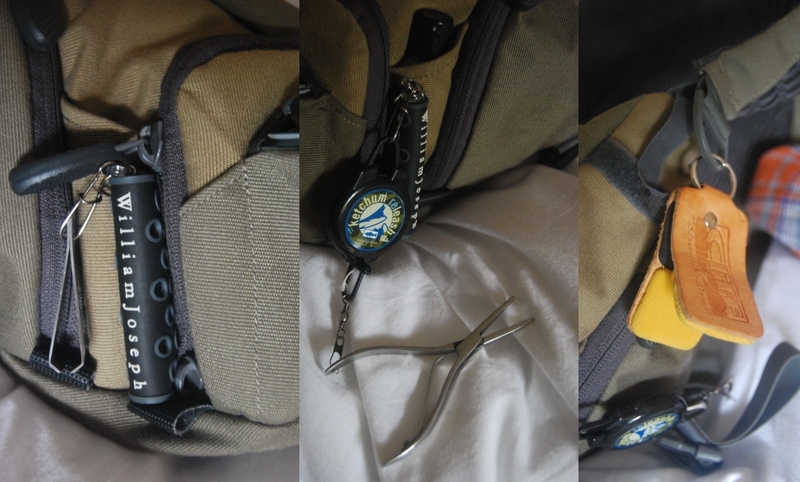 I attach a pair of line nippers to the right one, and my foreceps/de-barbers go on the left one. I find that the inbuilt zinger things aren’t long enough to be useful for foreceps that often have to be used close to the water. I attach my foreceps to a second zinger thingy which is then attached to the inbuilt zinger thingy. This gives plenty of zing. The zinger thingys: great for nippers and (with slight modification) foreceps. 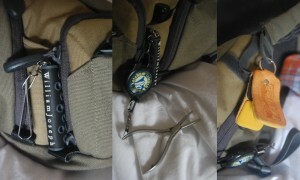 At right is the little D-ring at the front of the shoulder straps: useful for line straightener/fly dryer. The rear of the bag is comprised of a large main compartment with a smaller pocket at the rear. All open and close with strong zips. One of the things I like are the extra straps inside the main compartment, and the one on the outside. I sometimes use this to store a rolled up jacket in the colder months. This makes you look like one of those Red Bull cars (the ones with the giant cans on the back), but it’s effective and saves you having to carry a rucksac. The main rear pocket: enough space for lunch and some water. Fly obsessives can store extra fly boxes in there too. The actual rear compartment is reasonably large. I find I can get a good sized lunch in there (banana, bread, crisps, chocolate bar), together with a half filled Platypus foldable bottle. This is a great thing actually, allowing you to fold your water bottle around your lunch, which maximises the space available. There certainly isn’t a suitcase of space back there, but it’s enough to be useful. 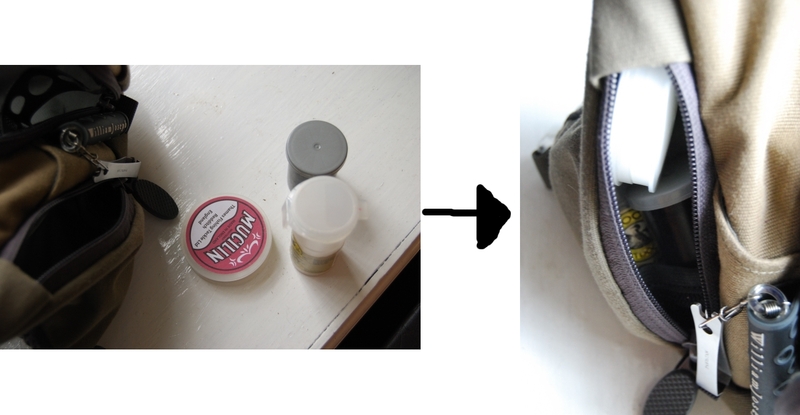 It also limits the crap that you might decide to bring along if you were using a rucksac. The rear external strap and pocket. Good for strapping on a rolled up jacket, and storing a head torch. Well I don’t like the fact that one of the zip handles from the main front compartment dropped into a river last winter, rendering me with one usable zip. The actual zips seem to be really excellent: very strong and quite wide, and generally inspiring confidence. Apart from that….not too much really. It fits its target design criteria almost perfectly. A bit zippy: one of the zip handles fell off my GBC, which was annoying. But it’s not the end of the world. Overall I have to say that I really like the GBC. I have used it for more than two seasons now, and I don’t really find myself drawn to anything else in the gear carrying world. For single day fishing trips where you need a bit of food, but don’t want to carry a rucksac, I think it’s perfect. This is the kind of fishing I do the most of, so it suits me down to the ground. I like the fact that it rides high on your torso, far away from the water for everything but the most insane wading (or falling in…there doesn’t seem to be a solution to the problem of falling in and gear carrying). It took me a good wee while to adjust to the different feeling compared to a waistcoat, but I now find it really comfortable. I often stand in the river with the front compartment open, musing quietly at the flies stuck to the patch and wondering what to do. Everything of importance is right there at your fingertips, which saves rummaging around in endless pockets, as much as I do in fact enjoy that.. I recently learned that William Joseph came out with a new version of this pack, which looks, to be absolutely honest, a bit rubbish (hey at least I’m honest). I much prefer the kind of slightly bungled feel on this older version, which feels like it was made by people who actually fish. I haven’t had the new version in my hands though, so who knows, maybe it’s a cracker. I bought my GBC on Ebay from a US seller when they were going cheap, so look around, I’m sure there are still some of the older ones circling about. Thanks for the description on the bag…it looks great. Any idea on how to get one for myself? The sample I have is a few years out of date now. They’ve since replaced it with a newer looking model (comparable in features). I bought mine on Ebay discounted from the US. There are several companies in the UK (sportfish, gac) which import them I think.